AWS runs its billing on a monthly cycle, and at the end of the month—called the monthly rollover—there is a slight delay because they are in the process of finalizing your bill. It's important to understand how this monthly rollover period affects your billing data. We break down the implications in the following sections. When Does AWS Finalize the DBR? Amazon will not write the final hours of the last day of the month sometimes for a day or two into the following month. It can also take them a day or two to begin writing the data for the new month. So, if the transition from March to April is occurring, the billing data for March 31 will be in flux until the first few days of April; the first day(s) of April will see a delay as well. How Does This Affect Your Daily Billing Emails? Because of the delay in finalizing a prior month and to avoid providing you with erroneous information, some of your CloudCheck Daily Billing emails may be delayed. If delayed, the days that typically are affected are the final day of the month (March 30 in our example) up through the first few days of the new billing month. The length of the delay depends on the time it takes for AWS to finalize your old month's data. Your Monthly Billing Summary email follows the same logic and will be sent when the billing data is fully processed within CloudCheckr. Once AWS Finalizes the DBR, What Does CloudCheckr Do? If desired, CloudCheckr will send you an alert you when this process is complete. Certain charges will not display CloudCheckr until your AWS bill has been both finalized by AWS and fully loaded into CloudCheckr. Payee Support Charges: whether it's for an individual account or an account family, Payee Support Charges are calculated at the end of the month. Proportional Payee Amortization: the amount of amortized cost is calculated at the end of the month. In addition, invoices for your clients are not generated by CloudCheckr until the month has been finalized and fully loaded. This is the default and safest behavior, but we do give you the ability to customize/override this when you initially set up an invoice. You can configure an email alert to notify when your month?s billing data is finalized within CloudCheckr.Navigate to the AWS Bill Invoice Generator located at Cost > AWS Partner Tools > Report > Generate Invoices. Click the blue Email button at the bottom. 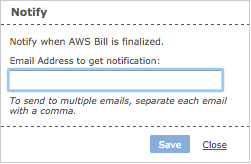 A pop-up will display where you can enter your email address to be notified when the AWS bill is finalized in CloudCheckr. For any changes to your List Cost data after the month has been finalized (such as custom billing charges or payee support charge recalculation), you will need to manually set the month to reload. Full directions for reloading the DBR are here.